About 9 years ago when I was first learning to brew I remember hearing about this new brewery planning to open in Nashville. A guy I worked with knew I liked good beer so he told me about his buddy Linus who also knew how to brew beer. 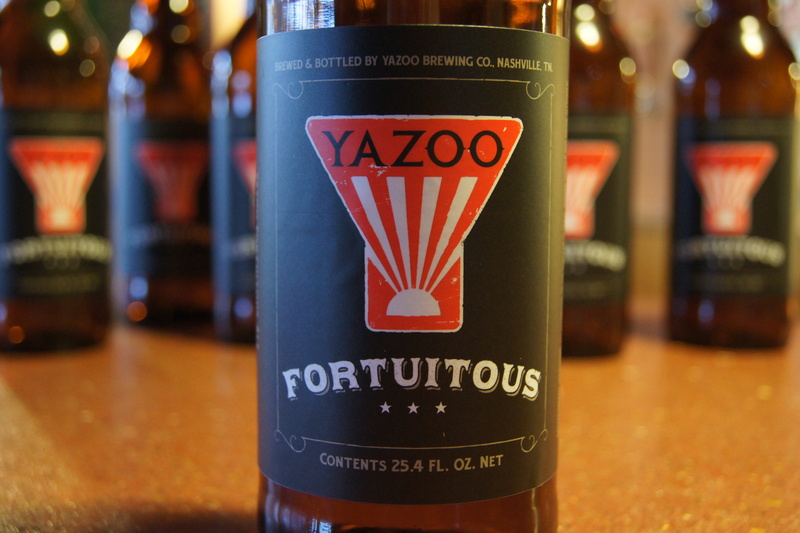 Well he happened to be the guy who was opening the new brewery called Yazoo. A few months later I remember meeting Linus and trying his beer for the first time at The Music City Brewers Festival. Chit chatting with him at the festival I remember thinking what a nice guy he was to give me some brewing tips and to take time for beer chat. 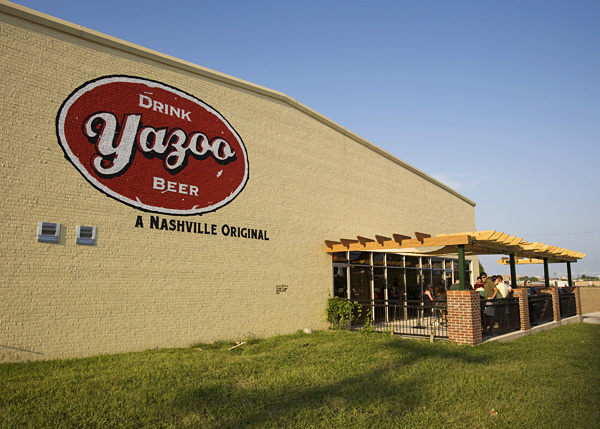 Fast forward to 2011…while much has changed like Yazoo outgrowing their old location at the Marathon Motorworks building or the fact you can order a Yazoo at almost any restaurant in Nashville, one thing that hasn’t changed is Linus still makes the time to sit a chat about beer. 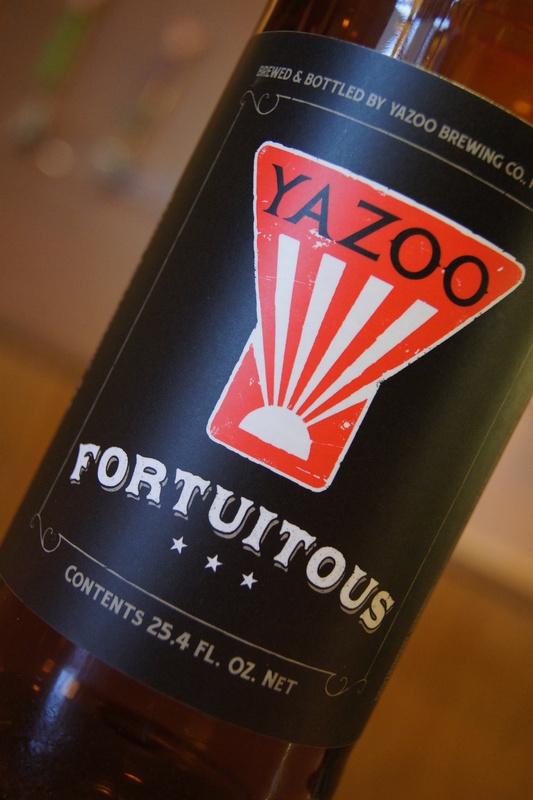 I’ve been fortunate enough to follow Yazoo from the beginning and in 2009 even brew a batch of beer on their system for a taproom only release. So I was thrilled to learn one of my favorite breweries that just so happens to be local too had a sour beer in the works. 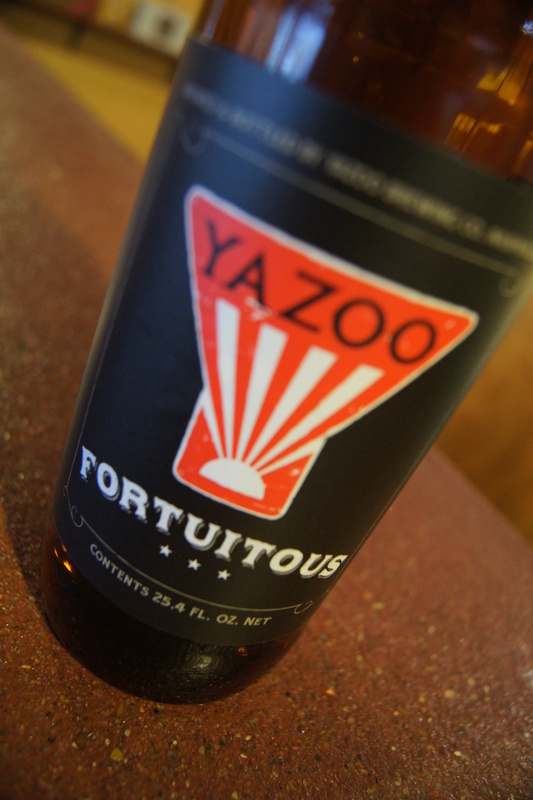 A few days ago I sat down with Linus in the taproom to talk about their most ambitious beer project yet: Yazoo “Fortuitous”. Which is based on their award winning Cherrywood Smoked Porter called “Sue”. 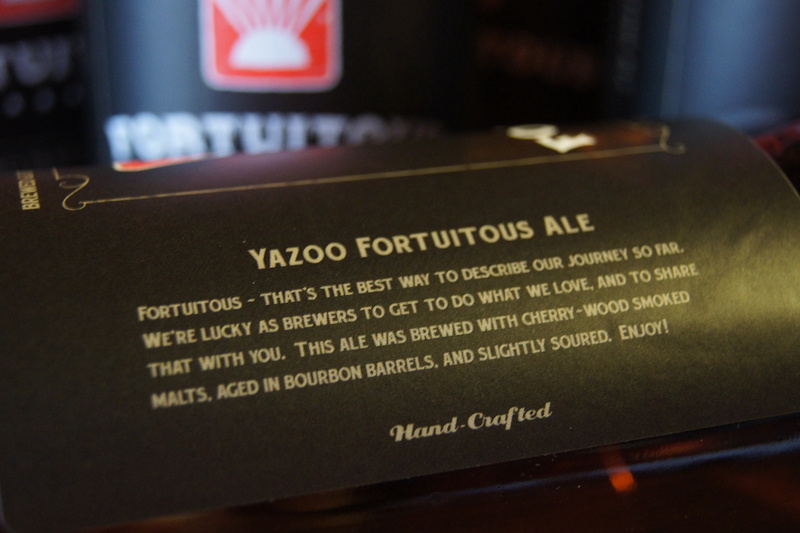 for·tu·i·tous : (Adjective) Happening by a lucky chance; fortunate. ETF-So what’s the back story and timeline on this batch of beer? 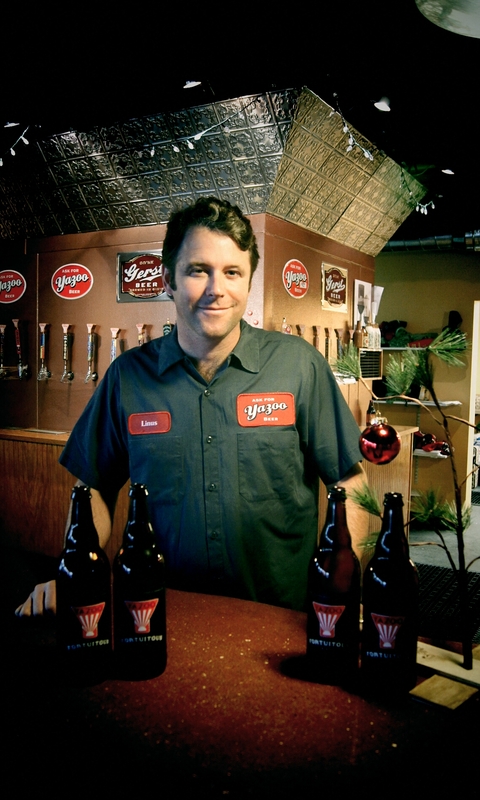 LH-It’s kind of a convoluted story….We brewed a batch of Sue in August of last year (2010). In late November we started getting some calls from stores saying people were bringing these back. They were saying it had a sour taste to it, so it had been about 3-4 months since then. So we brought back everything we could get our hands on and replaced it with a fresh batch. But as we were tasting it, we’re like wow its kinda unfortunate we weren’t shooting for that flavor because it’s starting to develop into something interesting. So then the idea came to take some Sue and sour it with that micro organism. We looked at it under the microscope, we never sent it off for testing, but based on the way it tasted and looked like under the microscope we think it was pediococcus. In the early stages it had a lot of diacetyl, but that receded and it developed that real nice sour taste. But by itself it had almost a thin slightly metallic flavor that we thought needed to be rounded out. We also had been barrel aging some Sue in Corsair barrels so we thought that would make a great blend. The bourbon in the middle and beginning seemed to enhance the sourness of the finish. ETF-What was your first reaction when you realize there really is something wrong with this batch and it’s not just a few people thinking something is wrong? LH-This happened during a transition period from Marathon to here and you know especially beers that are sitting warm on the shelf (which unfortunately in Tennessee a lot of the high alcohol beers are kept warm) it’s not unusual after 3-4 months if you picked up the slightest bit of infection its gonna start to show. So we thought we would treat this as a learning process … try to figure out where it came in, but its kind of hard to pinpoint since we are in the middle of moving tanks and trying to figure out whats going on. But yeah your first thought is oh crap! But you know since its was based here in Nashville and we don’t ship Sue hardly anywhere else we knew we could replace that beer for people and they’d be pretty happy. Anybody who complained we replaced it with a fresh 4 pack even if they drank half the pack, so everybody seemed pleased. ETF-How long after you got everything back here did you decide well we have this unintended sour beer, but I think we can make something out of this? LH-It just seemed a shame to not at least try to do something. I knew the time would come where we could play around with things like this. Now that we have the space we just put this beer away from everything else and it just seemed like an opportunity to showcase some different ways we could spread our wings. With the (12th South) Winter Warmer coming up it just seemed like a great time to play around with some different things we hadn’t done before. ETF-Whats the breakdown of the blend? LH- It’s tough because we basically kept blending it into one of our smaller 10 barrel fermentors that we kept from Marathon until we liked how it tasted. But I would guess it’s probably around 30% barrel aged Sue, 65% sour, and we did blend a little fresh Sue in (5%) to round out the aroma. ETF-How long did it take you to reach the point where you know that’s the final blend that’s the one we are going to bottle up? LH- We just kept getting small sample sizes of each part and pouring ourselves blends. Once we had an idea of how we wanted it to taste we started blending them all together. To me you want to start with your most extreme aggressive flavors first and then start blending in some lighter flavors after that. We loved the bourbon aroma but it was almost too much by itself. The sour had some nice notes but it was kind of thin and metallic in the middle so you keep playing with the blend. But you want to take your strongest flavors and diluting them with your different flavors. ETF- How many times did it take to get the blend right? LH- Well I started having this idea of blending the two shortly after we got all the sour Sue back, but it took awhile before we could play with the blends because it did have a lot of diacetyl, but we thought time will cure that. We had been tasting it for around 6 months and there was interest to put it out so a great place to showcase it and get reaction was at the Winter Warmer. ETF-When will this beer be distributed? LH-We will give the release date out on Facebook and Twitter. But right now I know it won’t be until at least a few weeks in 2012. We are also trying to figure out how to release it so it’s fair for everyone and they have a chance to try a bottle. ETF-How many bottles do you anticipate will end up in distribution? LH-We are shooting for about 800-1000 (25oz bottles), which isn’t very many at all but we are hoping that the success of that will lead us to do some bigger batches of sour beers. ETF- Tagging along with that last answer…you guys did the all Brettanomyces IPA last summer and now you this bacteria beer. Did you ever think a year or 2 ago that you would let these into your brew house? LH- Well no …not really, but you’ve always got to be careful. We now have that dedicated tank we don’t do anything else “normal” in. Cross contamination is always a worry, but these things are close to normal yeast so the things you use to kill or harm your normal yeast will kill them. So it’s really just keeping them separated during aging and making sure you don’t use certain hoses you transferred sour beers for other normal beer things. It’s a scary process until you see what the dangers are and what precautions people need to take. I think as brewers you are always worried so much about the negative side of sour beer, but once you taste one of these beers you are like “wow”! To me it’s almost worth the risk to be able to produce something like that. ETF-With the dedicated tank do you have anything planned for the coming year? LH- Yep… this is one of my favorite styles of beer and it’s neat to see the general public’s taste going that way. I think for the next 3-4 years sour beers are going to be as hot as IPA’s. So yeah it’s something fun to do, but the bad thing is there is so much time and effort invested into it that you can’t really build your business around it unless you are Cantillon or like them. But it’s something you can have a lot of fun with and while it will never be a major part of our business here its something we as brewers love doing and sharing with people. …as brewers you are always worried so much about the negative side of sour beer, but once you taste one of these beers you are like “wow”! I think a lot of inventions are probably made by that, largely by accident, and it is neat that they were able to embrace it. I haven’t had a chance to try a sour beer yet, but we have a bunch of local breweries around here, as well as several bars that specialize in locally brewed beer, so I am going to check and see if there is anything similar around here. If not, Nashville isn’t that far to go! Professor Goodales did arrive. The Professor did spread the good news and credit it to you, Brandon, and of course to Embrace the FUNK. Great job, Brandon. Fell free to do the same in return: great beer ALWAYS needs more press!